On October 22, 1962, U.S. President John F. Kennedy announced a “quarantine” of Cuba, in retaliation for the discovery of Soviet missile facilities on the island a week earlier. 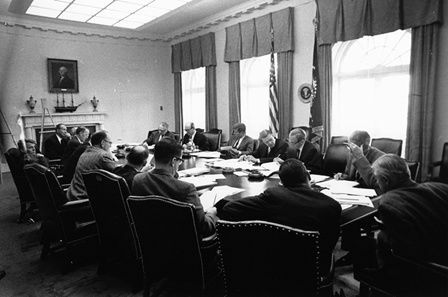 President Kennedy meets with members of the Executive Committee of the National Security Council (EXCOMM) in the White House on October 29, 1962. The Cuban Missile Crisis had ended the previous day, October 28, when Soviet Premier Nikita Khrushchev acquiesced to Kennedy’s demands, agreeing to remove missiles from Cuba if the United States would promise not to invade Cuba and secretly remove missiles from Turkey. This agreement averted potential disaster—actual nuclear conflict. On October 22, 1962, U.S. President John F. Kennedy announced a “quarantine” of Cuba, in retaliation for the discovery of Soviet nuclear weapon facilities on the island a week earlier. This brought the conflict known as the Cuban Missile Crisis to a diplomatic height. Kennedy and his advisers (including Secretary of Defense Robert McNamara and Attorney General Robert Kennedy, who chronicled the Cuban Missile Crisis in his book Thirteen Days) made sure to announce a “quarantine” and not a “blockade” of Cuba. A blockade prevents all trade and travel from taking place around a specific area. A blockade is officially an act of war, and the Kennedy administration did not want to directly confront the Soviet Union. A quarantine only prevented “all offensive military equipment under shipment to Cuba.” U.S. Navy ships were deployed around Cuba to prevent Soviet freighters from delivering nuclear missiles or the material to maintain and launch them. The Cuban Missile Crisis ended less than a week later. The Soviet Union agreed to withdraw all missiles from Cuba, while the United States agreed to withdraw all missiles from Turkey (which bordered the Soviet republics of Armenia and Azerbaijan). to proclaim or make known publicly. military isolation of a specific area. to address a problem or person directly. to move military troops, support personnel, and equipment. large ship used for carrying heavy cargo, or freight. invading or attacking, not defending. enforced isolation, usually to prevent the spread of disease. reprisal, or an act taken in response to an injury or offense.